Vijayawada: Chief Minister N Chandrababu Naidu expressed anger over airport officials for the tardy progress of new terminal building works at Vijayawada airport in Gannavaram on Monday. The Chief Minister asked the officials to speed up the works to complete them before Krishna Pushkaram as large numbers of VIPs are expected to visit the city on the occasion. The Chief Minister, who landed in the airport from Hyderabad on Monday, made a surprise visit to the site of new terminal building works. 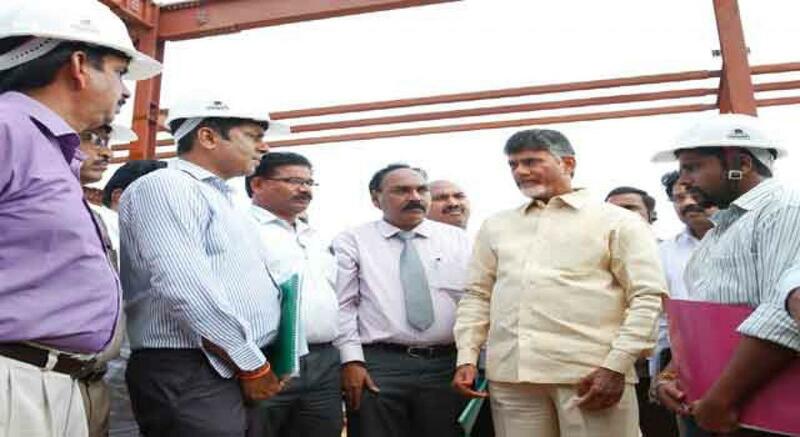 He inspected the works and expressed concern over the slow progress of works. He directed the district collector to take initiative to speed up works. It may be noted that Chief Minister Chandrababu Naidu, Union Minister of Civil Aviation Ashok Gajapathi Raju had laid foundation for the new terminal building eight months ago. District Collector Babu A, Intelligence IG AB Venkateswara Rao, airport director Madhusudhana Rao and others were present.